Betty Buckley's cabaret show Broadway By Request is a real treat and a perfect kickoff to Hartford Stage's SummerStage series. The star of such Broadway shows as Sunset Boulevard, Cats and 1776, sings songs from those shows and throws in others, some requested by members of the audience. Opening night, one lucky attendee got "Happy Birthday" sung to her by the star and Hartford Stage Artistic Director Michael Wilson joined Buckley on stage to deliver a line as Rose's father in a number from Gypsy. Local celebrities Scot Haney of Channel 3 News and Allison Demers of WRCH Lite 100.5 are scheduled to make appearances in the run, which ends Saturday. 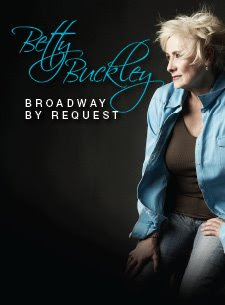 When she's not belting out favorites from Broadway musicals, Buckley shares anecdotes about her experiences in or auditioning for shows. She is backed up by a trio of musicians (Clifford Carter on piano, Anthony Pinciotti, drums and longtime Buckley collaborator Tony Marino on bass). The intimate setting, including cabaret tables up front, is a real treat and the quick 90-minute program doesn't seem near long enough. Buckley is one of the few performers who can move me to tears with her songs (I was a sobbing mess at Sunset Boulevard), and her "Memory" from Cats is not to be missed. Additional shows upcoming in the Summer Stage series are Thwak! featuring the mayhem-producing, noise creating Umbilical Brothers (July 15- Aug. 2) and Yesterdays, an evening with Billie Holiday (Aug. 5-22). For additional information, call the Hartford Stage box office at 860-527-5151 or visit hartfordstage.org.